Disclaimer: The information on this page is intended for individuals who have been medically diagnosed with carpal tunnel. If you suspect that you have carpal tunnel then it is important to visit a qualified medical professional in order to rule out any other possible causes prior to considering any advice or treatment option. Are carpal tunnel symptoms such as numbness, tingling and pain starting to affect your sleep, your ability to work, or just taking a toll on your lifestyle in general? As with most people suffering from numbness, tingling and pain caused by carpal tunnel syndrome, you are more than likely looking for a non-invasive way to relieve your pain and discomfort and to generally improve your lifestyle in general. Discover below how the OSMO Patch together with proper rest can be used effectively to support the relief of inflammation and pain associated with carpal tunnel. Let us first begin by getting a better understanding of carpal tunnel syndrome, such as what is carpal tunnel syndrome, carpal tunnel syndrome causes, carpal tunnel symptoms and also what are the carpal tunnel treatment options. The term carpel tunnel is often used interchangeably with the term carpal tunnel syndrome, however the carpal tunnel is more correctly the name given to a region within the wrist that has a small space where two important nerves enter the hand from the arm. These nerves are the median nerve and the smaller ulnar nerve which control feeling and movement within the hand. As well as these nerves there is also a network of tendons that pass through the carpel tunnel. The Carpel tunnel space can become narrowed due to inflammation and swelling resulting in compression of the median nerve and ulnar nerve where they pass through the wrist. This compression results in a number of symptoms which ultimately can cause considerable discomfort and pain. This condition is medically known as Carpal Tunnel Syndrome and when it affects both hands it is called bilateral carpal tunnel syndrome. Impact or repetitive stress to the wrists from sports such as boxing, baseball and weight lifting. The symptoms of carpal tunnel syndrome may include tingling, numbness and pain in the hands and fingers. In particular tingling and numbness is normally felt in the thumb, index, middle and sometimes the fourth finger. Many individuals can find that these symptoms worsen at night. When carpel tunnel syndrome becomes chronic, individuals may also experience sharp pain shooting down the forearm or burning sensations in the hand. In addition chronic carpel tunnel syndrome can lead to decreased hand grip strength and wasting of muscles in the hand (atrophy). Finally let’s discuss carpal tunnel treatment options? Other then resting and possibly immobilising the wrist carpal tunnel syndrome treatment is classified as either non-surgical or surgical. Non-steroid anti-inflammatory drugs such as aspirin and ibuprofen. Diuretics medication (“water pills”) to reduce swelling that may result from fluid retention. The most common surgical procedure for carpal tunnel syndrome treatment is known as carpal tunnel release which is performed by either Open release surgery or Endoscopic surgery. The aim of carpal tunnel release surgery is to relieve the pressure on the median nerve by severing the band of tissue around the wrist. While surgery can produce very good results, full recovery can take many months and the risk of infection, nerve damage, stiffness, loss of strength and pain are very real and should be properly considered and discussed with your doctor before taking this decision. If you have already used or tried these treatments and found little benefit. Alternatively you may simply prefer to use a natural carpal tunnel treatment when dealing with their health. The OSMO Patch used together with proper rest now offers an Intelligent 100% Natural carpal tunnel treatment Alternative! 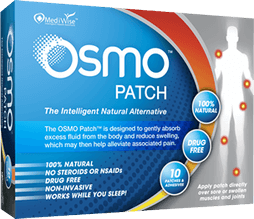 The OSMO Patch has been especially designed to draw fluid from the body and reduce swelling, inflammation and associated pain. This makes the OSMO Patch ideal for reducing inflammation in the wrist and naturally eliminating the pain and symptoms of carpel tunnel. The OSMO Patch is simply stuck on the wrist just before going to sleep. The OSMO Patch then goes to work reducing inflammation and swelling in the wrist by drawing out fluid and stimulating blood flow continually throughout the night while you sleep. Then when you wake up in the morning the used patch is removed and simply discarded. So if you are ready for a natural & effective approach to supporting the relief from numbness, tingling and pain due to built up inflammation in the wrist and carpel tunnel then the OSMO Patch may be the Answer! So far the patches are working great. Thanks. Hi, I ordered these patches for my father 6 weeks ago also…. They do work. Thank you. I have ordered more today. Please post a.s.a.p.